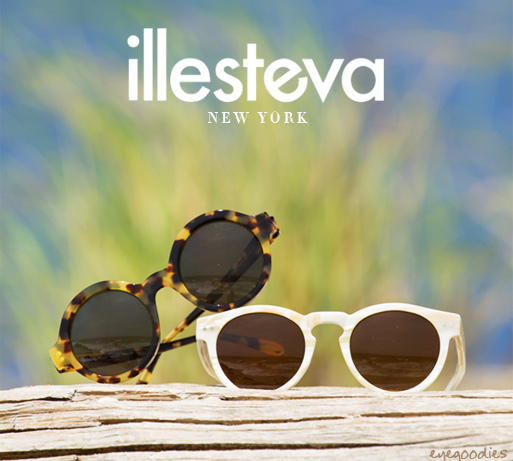 Eyegoodies is proud to welcome to the site ILLESTEVA sunglasses. “Handmade in Italy, Designed in NY” is the philosophy behind New York based, ILLESTEVA. Founded in 2009, Illesteva takes inspiration from downtown NY, as well as music, fashion, and photography, to put a distinctly contemporary spin on classic style. Working in concert with some of the leading eyewear manufacturers in Italy, France, and Germany, they seek to push normal boundaries of design by exploring fresh shapes, colors, and materials like acetate, wood, and titanium. In a short time they have amassed quite a following by both fashion insiders as well as just about anyone with a sense of style. Press for the brand include magazines such as Vogue, GQ, InStyle, Nylon…, and celebrity fans include Lady Gaga, Beyonce, Daniel Craig, Julia Roberts, Kate Bosworth, Alexa Chung, Kirsten Dunst, Sienna Miller…just to name a few. 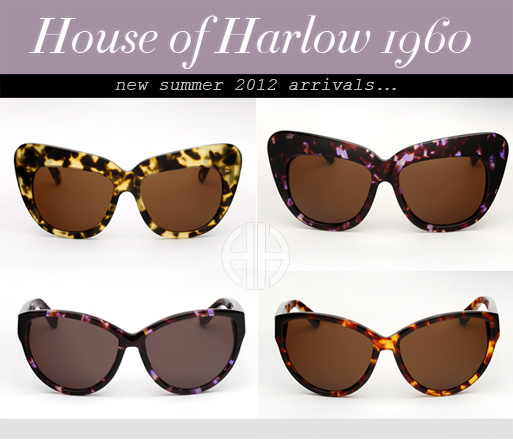 The latest Summer 2012 House of Harlow sunglasses have arrived, giving us some great new shapes as well as some eye-catching unique new colors. The all popular Chelsea model returns, but this time in stunning “Leopard” as well as “Bloom”, a real standout. For a sleeker cat-eye, with a more subtle touch try the Chantal (our favorite of the new shapes). Thierry Lasry sunglasses 2012 collection in now available. Fusing old world glamour with contemporary design, Thierry Lasry gives us a variety of one of a kind stunning styles for 2012. From reinterpretations of the cat-eye to a bold round shape, each delectable style is available in some of the most beautiful and unique acetates you will ever see. Colors which range from classic black or tortoise, to limited edition multicolor tortoises and designs crafted from rare sheets of vintage Italian acetate. As always, each piece is handmade in France with the utmost attention to every detail, from sizing and proportion to impeccable craftsmanship and the best materials. 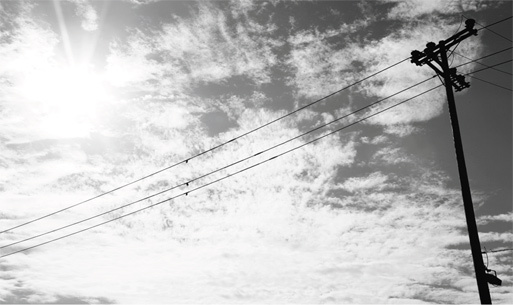 Checkout the new frames below paired with some of our favorite shots from the campaign. The Mosley Tribes Summer 2012 collection is now available. 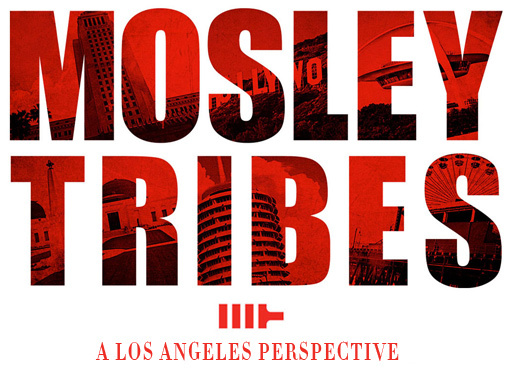 This season Mosley Tribes is paying tribute to the City of Angels, Los Angeles California, home of their headquarters as well as a continual source of their inspiration. Although styles and trends frequently change in Los Angeles the new releases this season are both unique and timeless — translating for any style and any local, whether the city streets or the beach. The collection features an array of classic metal and acetate frames, from the clean all plastic unisex “Stafford” to the vintage inspired squared off “Cayton” aviator (our favorites). Each piece boasts premier mineral glass lenses providing superb optics, with polarized, photochromic, as well as anti-reflective coated lens options. Check out the new pieces below paired with some of our favorite imagery from the campaign; photographed in the places and on individuals that inspired their creation. 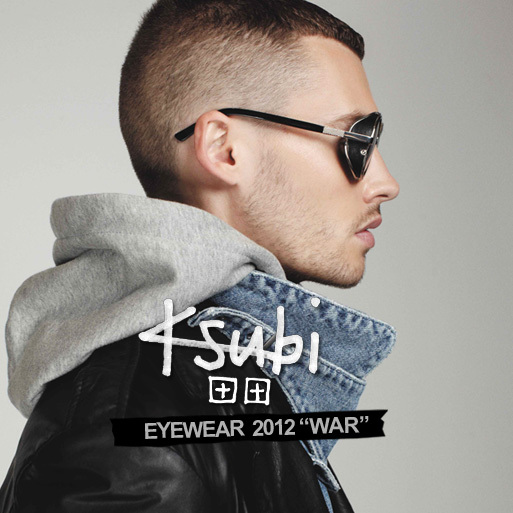 Ksubi eyewear’s 2012 “WAR” collection is now available. The collection, fittingly entitled “WAR”, is by far our favorite Ksubi offering to date. There’s a fresh modern aesthetic created which is both raw and refined. It effortlessly fuses ideas and techniques from classic steam punk, traditional biker, fashion, street and sports. From modern military aviators with different textures(“Cisco”) to “winged” cat-eye frames(“Rana”), the range presents an array of one of a kind styles which are fashion forward yet remain very clean and wearable.